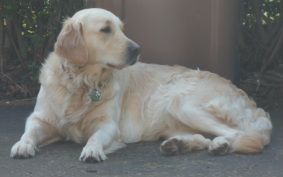 We live on the beautiful North Norfolk coast with four golden retrievers, Cassie, Lily, Molly and Ben, much loved family pets. Cassie's pedigree includes field trial champions, which gives her a traditional, finer build and she is not as heavily coated as some modern show lines. 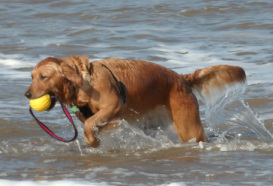 She is an intelligent dog and loves retrieving and swimming. Like all golden retrievers, she loves to be part of the family. Lily is from Cassie's first litter and her pedigree includes show champions as well as field line. She has grown into a beautiful dog, with a very gentle and calm nature. Both Cassie and Lily enjoy obedience and agility classes and of course long walks on the beach. They are especially fond of muddy puddles! Molly is our show girl, with show champions in her line. We have had a lot of fun learning ring craft and travelling around the country for shows. Molly qualified for Crufts 2016 and 2018. Despite her pedigree, Molly wallows in muddy puddles just as much as the others, if not more! She is also a strong swimmer and loves nothing better than swimming out to sea chasing after seabirds. Ben is from Lily's third and last litter. He absolutely loves the sea and would spend all day there if he could. Very affectionate and loving, he was born on Burn's Night, 25th January. We select stud dogs with good pedigree, temperament and gentle natures. Sires and dams have relevant health checks. All puppies are Kennel Club (KC) registered. The puppies are socialised in a family environment. Each puppy goes to it's new owner with a puppy pack that includes food, advice on puppy care and four weeks free Kennel Club insurance. Each puppy is also checked by a vet, wormed and micro-chipped prior to leaving. Lifetime support is included and we like to keep in contact with our puppy owners.